The core theme of the Cape Town Good Hope Lab (24th of September – 3rd of October) is “Sustainable Urban Development through Local Collective Action”. The objective is to catalyze a local discussion on forms of collective action between citizens, NGOs and local government to implement the Sustainable Development Goals. Urban food gardening serves as a case of interest as recent social research shows that the actual value of urban agriculture lies beyond income generation and is rather related to the expansion of social networks. Against this understanding the Cape Town Good Hope Lab works in close collaboration with the City of Cape Town’s Environmental Department and the South African Urban Food and Farming Trust (SAUFFT) who both stress the need to establish urban local food systems within Cape Town that improve food security, strengthen community cohesion and reduce poverty. 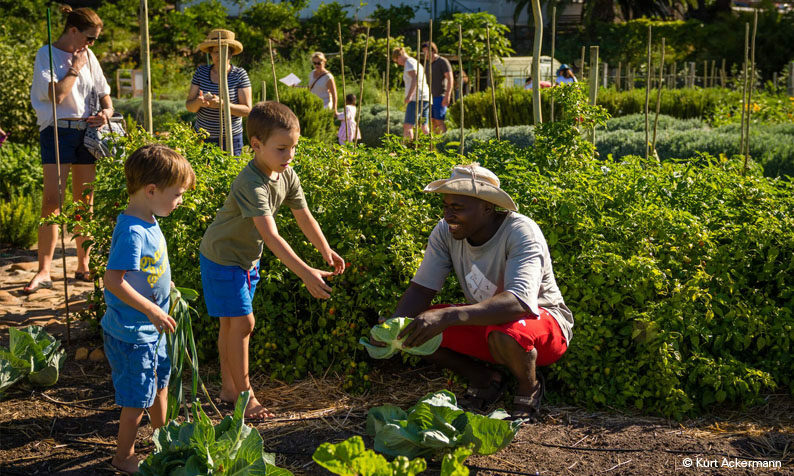 Based on the experience by the successful Oranjezicht City Farm, the South African Urban Food and Farming Trust intends to establish a ‘Good Hope City Farm’ as part of the Good Hope Junior School in Vredehoek, downtown Cape Town. This will be an excellent example to study the role of urban agriculture for collective action on various scales (school, neighbourhood, city level). This will be the basis for conceptual ideas and strategies to strengthen sustainable livelihoods and to improve quality of life in the city. The summer school is supported by the German Academic Exchange Service (DAAD) and Engagement Global. It is a joint cooperation between the department of International Urbanism at the University of Stuttgart, the School of Architecture, Planning and Geomatics at the University of Cape Town (UCT) and the department of Landscape Ecology at the University RWTH Aachen as well as the South African Urban Food & Farming Trust (SAUFFT) and the Environmental Department of the City of Cape Town.